The first article in this two-part series appeared in the June 15 issue of GEN. It examined the challenges and opportunities associated with Brazil, Mexico, and Colombia. This article picks up from where the other left off, providing insight into the unique aspects of the pharmaceutical markets in Chile, Peru, and Argentina. While each of these countries has a relatively small population as compared to Brazil or Mexico, they have a growing GDP per capita. Moreover, as Figure 1 illustrates, these three counties have become hot spots for clinical trials in the region. 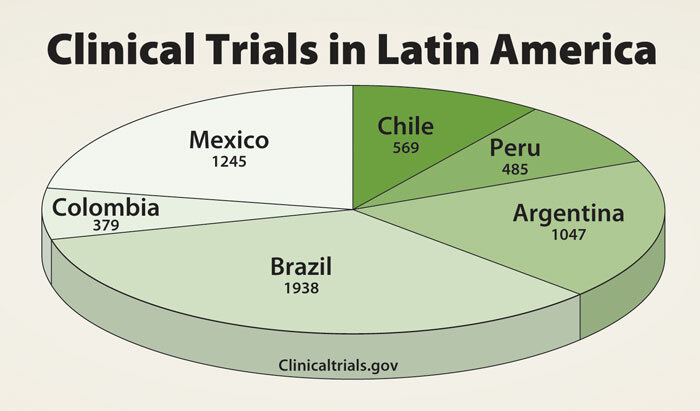 As part of the Latin American region, these three counties have gained increased international attention due to a number of important changes in their regulatory processes with respect to pharmaceutical products and conducting clinical trials. As their importance in the region, and indeed the world, continues to grow, so too does the importance of understanding the advantages and obstacles to be found there. Although Chile is a relatively small country in the region, the Chilean pharmaceutical market is the sixth largest in Latin America. However, the domestic pharmaceutical industry in Chile benefits from a number of various protectionism measures by the Chilean government. That characteristic notwithstanding, pharmaceutical expenditures in the country are expected to increase in the long run, partially due to the introduction of several health-related reforms as well as TRIPS-related patent protection measures. It is also worth noting that the pharmaceutical industry in Chile is led by domestic companies. Moreover, domestic manufacturers are expected to transition away from copy generic products toward the production of branded pharmaceuticals (through licensing from multinational companies). However, domestic producers in Chile have traditionally relied substantially on imported raw materials. While quality-control standards in Chile continue to mature, Chilean exports of pharmaceuticals are relatively low and limited to the Andean region. Chile has been considered among Latin America’s more successful countries in terms of economic performance. 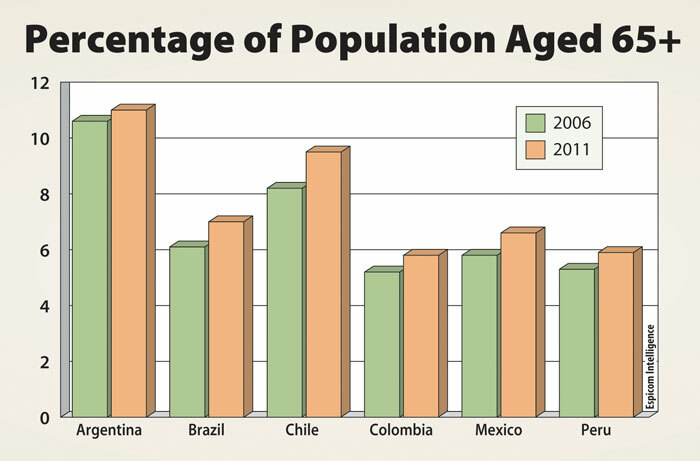 With an aging population on par with larger markets in the region (Figure 2), Chile is ripe for growth in the pharmaceutical sector. Indeed, in 2006 the Chilean pharmaceutical market was $1.3 billion and posted a growth rate of 9%. To put this in perspective, Brazil, a country that has typically received wider attention in the region, had a smaller growth rate of only 5% and per capita spending of $70 as compared to $82 per capita in Chile. The pharmaceutical market in Chile is regulated by the Ministry of Health, which is responsible for formulating and setting health policies for the country. To that end, one of its functions is to “exercise stewardship of the health sector.” Additionally, this is the regulatory agency that receives, reviews, and approves new drug registrations. As in Brazil and Argentina, Chile offers incentives to pharmaceutical companies to register generic products by discounting the registration application fees for generics. While the cost of registering an original pharmaceutical product in 2003 was $1,300, the fee is reduced to $800 for generics and biosimilars. In either case, however, drug registration in Chile can take anywhere from eight months to a year. This time frame for regulatory approval is considerably longer than in many other countries in Latin America. In order for a pharmaceutical company to receive import authorization in Chile, the process can take anywhere from 14 to 21 weeks. Because the application is required to be in Spanish, document translation is a necessary first step, which may take two to three weeks to complete. In the next phase of the registration process, the applicant makes a submission to the Institutional Review Board (IRB) and the Ethics Committee. In Chile, the regional ethics committee that must approve the application prior to its submission to the Ministry of Health is the Comite de Etica Cientifico (CEC). Submission to and approval by the IRB and CEC can take six to ten weeks, and this time frame may be longer depending on the CEC’s volume of work at that time. Once an applicant has received IRB and CEC approval, the dossier is submitted to the Ministry of Health for review. The Ministry of Health review, approval, and drug import authorization typically takes just four to six weeks to complete, after which time the import process takes place. Namely, this includes the drug use and distribution authorization, which takes an estimated two weeks. Collectively, the estimated time line that a pharmaceutical company can expect for drug registration in Chile is approximately 14 to 21 weeks. Peru, while considered among the smaller countries in Latin America, has been a stable market in the region. International pharmaceutical companies doing business in Peru would experience a characteristic trait of the Peruvian market that Latin American countries receive noticeable preferential treatment. Moreover, there is little enforcement by the Peruvian government of the bioequivalence measures that are in place in the country. That being said, the pharmaceutical market in Peru is increasing, and the outlook for the industry continues to be positive. In the next five years, the pharmaceutical market is expected to grow, with a high one-digit compound annual growth rate (CAGR). Most pharmaceutical production in Peru is done by local manufacturers of branded generics or generic drug products. In fact, domestically manufactured pharmaceuticals account for 70% of the total market in Peru. While the rest of the world suffered through the global economic crisis in 2009, the Peruvian market remained relatively unscathed. In fact, the market for pharmaceuticals reached $1 billion in total sales (which includes both the public and private sectors). In 2010, sales growth is estimated to be at least 10%, with sales reaching a minimum of $1.1 billion for the year. Such growth suggests that the pharmaceutical industry in Peru will be among the most attractive in the region. Peru’s pharmaceutical market is in a state of transition, and throughout 2010 a number of changes contributed to the evolution of the industry. Chief among these changes was the introduction of a new regulation of medicines, the New Law for Medications, Sanitary Products and Medical Devices. A number of years in the making, this new law was finally approved in November of last year, followed by a six-month implementation stage. While the lasting impact of the new legislation remains to be seen, certain significant developments in the pharmaceutical industry have already come to light since the passage of this law. As a result of the new law, the Office of Medications, Raw Material, and Drugs is in a position of greater authority in the quality-control process with respect to pharmaceuticals in Peru. Another important provision in the new legislation introduces more stringent requirements for drug registration. These stronger measures include requiring GMP certification as well as bioequivalence tests to be undertaken for generics. To the extent that these requirements are enforced, the new law could have a transformative effect on the nature of Peru’s pharmaceutical industry, such as with respect to the number of suppliers and the variety of pharmaceutical products available on the market. Moreover, the introduction of stricter penalties for counterfeit drugs should result in a more competitive legitimate market as the informal market is reduced. The new legislation will also alter the time frame and costs associated with the registration of drugs in Peru and their approval. Upon the implementation of the new law, pharmaceutical companies can expect that the length of time to register their products in Peru will increase. While previously the registration process required approximately one week to complete, the new law has extended this time line to about six months of review prior to approval of the drug. Moreover, the new law has also increased registration costs. While registration fees were previously a mere $100, the new legislation has raised the costs to approximately $1,000, potentially changing the nature and quality of the pharmaceutical products that are now being registered in Peru. As the government in Peru continues its focus of providing universal healthcare in the country, such universal coverage will, no doubt, bring about increased opportunities in the pharmaceutical market, as one implication of such policies is the reduction of the black market for counterfeit drugs and a higher demand in the legitimate market. Moreover, although the government has suggested that it will take steps to reduce drug prices in Peru, there is a constitutional ban on price-fixing measures. Therefore, pharmaceutical companies intending to enter Peru can rest assured that, at least in this regard, free market competition is protected. While the new law and universal healthcare are among the factors to suggest that the pharmaceutical market in Peru will continue to grow, foreign drug manufacturers should be aware that domestic companies will likely experience most of this growth in Peru. That being said, participation by international firms is expected to grow. Consequently, at least in the foreseeable future, Peru’s pharmaceutical market will continue to be fragmented with many companies operating within the growing drug industry. Moreover, much as with other countries in the region, the majority of the growth in the pharmaceutical market in Peru will be in the generics sector. In 2009, the U.S.-Peru Free Trade Agreement was ratified, which drew more attention to Peru from U.S. companies. Together with Peru’s continuing economic growth and political stability, as well as regulatory reforms, the pharmaceutical market in Peru is emerging as among the more attractive markets in the region, offering a growing number of opportunities for drug manufacturers interested in doing business in Latin America. No discussion of Argentina can begin without first addressing the near total collapse of the Argentinean market in 2002. That year, the market collapsed by approximately 70%, sending the country reeling. Yet in the last eight years, Argentina has made strides to recover, and it is once again becoming an attractive market for foreign pharmaceutical companies. The pharmaceutical market in Argentina has had double-digit growth over the last few years, buoyed primarily by branded products. That being said, with the introduction of a formal price-cutting regulation by the Argentine government in November of last year, this growth rate is likely to slow in the near future. Moreover, in the pharmaceutical sector, Argentina is experiencing a trade deficit, with domestic manufacturers having a surplus while foreign companies are at a substantial deficit. Although the government in Argentina has expressed an interest in increasing access to pharmaceuticals, a number of challenges still plague the country. For example, copycat products have had significant dominance in the pharmaceutical industry, and the country offers minimal intellectual property rights protection. Additionally, how much the pharmaceutical market is likely to grow in the future will in part depend on how stable the Argentine economy will remain in general. Long before the economic crisis hit Argentina in 2002, the Argentine government had begun to institute measures aimed at the deregulation of the pharmaceutical market, such as reducing distribution barriers, freeing drug prices, and strengthening intellectual property rights. These governmental actions had the desired effect, and many foreign pharmaceutical companies entered the Argentine market. However, following the economic crisis, a majority of international pharmaceutical companies had to sell their local assets in Argentina, most of which became acquired by domestic drug companies. This changed the nature and makeup of the Argentine pharmaceutical industry. Currently, there are approximately 109 pharmaceutical manufacturers operating in Argentina. Of these, 90 are domestic companies and only 19 are foreign firms. The pharmaceutical market is further characterized by the role of generics in Argentina’s pharmaceutical market. After the economic crisis hit the country, the generics market in Argentina grew substantially. In recent years, however, this growth has slowed but has still remained an important sector in the Argentine pharmaceutical industry, even as branded drug products have begun to recover. For instance, in 2001, generic drug products made up 15.85% of the pharmaceutical market in Argentina (in volume). In the years following the economic crisis, this number climbed to 24% in 2005, encroaching on the market share of many branded drug products. Currently, Argentina’s pharmaceutical market is roughly made up of 15% generics. Since its recovery in the aftermath of the economic crisis, Argentina’s pharmaceutical market has grown steadily, now positioned as the third-largest pharmaceutical market in Latin America (just behind Mexico and Brazil). Today, overall sales of pharmaceutical products in Argentina stand at approximately $2.8 billion, and the economy in general has been making a comeback. Nevertheless, certain regulatory changes are potentially on the horizon in Argentina. The Argentine government is rumored to be taking under consideration the implementation of a new minimal local manufacturing requirement for pharmaceuticals. Such a measure would certainly have significant impact on international pharmaceutical companies operating in Argentina. The possible regulation would serve to protect the domestic drug industry, since foreign firms would have to license drug production to local firms if they did not have their own domestic facilities. That being said this regulation has yet to be implemented in Argentina. Moreover, such a requirement already exists in both Brazil and Mexico, so the perceived effect on foreign drug manufacturers may not, in fact, be so substantial. Together with Brazil, Mexico, and Columbia, the three countries discussed in this article represent a large and important region for the pharmaceutical sector. The pharmaceutical markets in each of these countries have gone through a series of transitions in recent years, and their regulatory development is still continuing. During these growing pains, there are some challenges that a foreign drug manufacturer must be aware of in order to effectively navigate the shifting regulatory and economic terrain in these countries. Although obstacles abound, there are many opportunities in Chile, Peru, and Argentina that international pharmaceutical companies can capitalize on as the markets there mature and evolve. To the extent that new regulations, stronger intellectual property rights enforcement, and other government efforts continue to take place, the attractiveness of the pharmaceutical markets in Latin America in general, and in these countries in particular, will continue to grow. In the current state of the pharmaceutical industry, foreign pharmaceutical companies will continue to be drawn to this region.